Apprising Ministries has been documenting for you the increasing syncretism and ecumenicism currently going on within apostatizing evangelicalism. With this we’ve also been witnessing an emerging ecumenical evangelical magisterium, which seems to have sprouted up in the skubalon fertilizer of the Elephant Room. 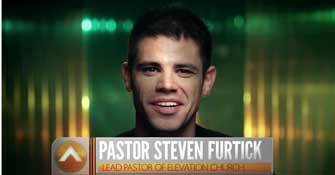 Prophet-leader Steven Furtick, a veteran of both ERs thus far, is actively involved in that new breed ecumenical evangelical magisterium. In fact, he’s the epitome of it as you’ll see in Steven Furtick Bringin’ On Word Faith And The Pastrixes. His Furtickism is a hybrid of Seeker Driven and quasi-Word Faith mythology. This was quite evident in his first book Sun Stand Still. In Review Of Steven Furtick’s Sun Stand Still I told you that it is so far from orthodox Christianity that it came complete with ringing endorsements from spiritual wingnuts like Dutch Sheets of the NAR and “Bishop” Eddie Long. 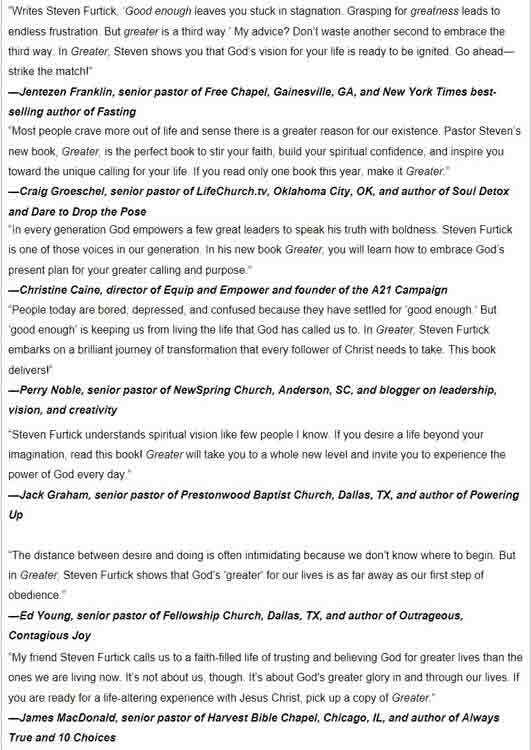 Today Furtick’s released his new book Greater. Many people have told me personally, and I’ve seen well-known evangelical names say, that Steven Furtick is teaching false doctrine quite harmful to the visible Christian community. I agree. Now ask yourself: If this is true, what does it say e.g. about men like former SBC president Dr. Jack Graham who proudly endorse Steven Furtick?